perplexed wondering what on earth I am talking about? But more and more garden enthusiasts and farmers are learning about the outstanding benefits of this great organic plant food. Liquidized worm castings are prepared to be bottled. and will improve soil structure and plant health. some worm castings and molassesand water. 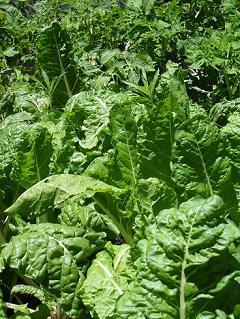 Spinach plants growing in Worm casting enriched soil. 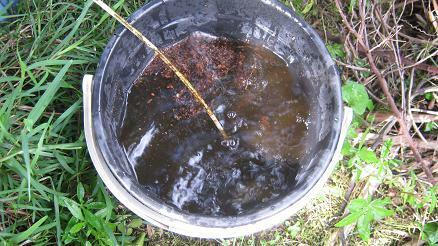 Liquidized worm castings brewing in a bucket. Take note when you want to use the tea as a foliage spray it is advisable to filter it through a cloth before you use it. This will remove any solids that might block the spray mechanism of your bottle. Although a properly prepared worm casting tea can be used pure it is quite ok to dilute it with water. A ratio of 5 parts of water to 1 part of tea can still bring great results. Try the recipe and tell us about your experiences! 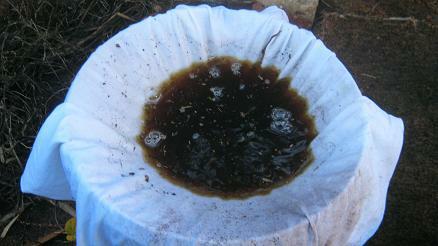 Another great product for your plants and garden soil is compost tea! Send us some pictures of your garden. We would love to hear from you! Return from "Worm Tea" to the "Home Page"